It’s Dynamite to help your horse’s stomach. The air is crisper, the leaves are changing, and soon the ground will become firm and covered in frost. As winter and cooler weather approaches, it becomes critically important that barn and farm dwelling animals are able to maximize nutrient absorption. While the quality of grass, hay, forage and soil decreases entering the freezing months, including or increasing Dyna Pro® prebiotic is of the utmost importance. Naturally occurring gut bacteria are responsible for much of the digestive process including the production of vital enzymes which help break down and assimilate food. 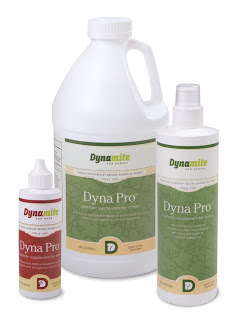 Dyna Pro is a biological feed additive designed to maximize digestive efficiency by nourishing the natural, good gut bacteria and encouraging them to reproduce and multiply. Over the years, and especially during winter months, environmental toxins increase, forage quality and food availability decrease, and stress remains high, which affects the digestion and physiology of animals. Gretchen Topel, Silver Director, says, “Our soils, our hay and pasture, our water and air just ‘ain’t’ what it used to be even say 20 years ago… In just the past month I have gone through a crash course in absorption… You can feed all the wonderful Dynamite supplements, the most pristine pasture, and the best of the best hay to a horse, but if the horse cannot ABSORB the nutrients, we have a major problem on our hands!” Including Dyna Pro in your daily feed ration will ensure your animals are getting the most out their feed, even though the quality may have decreased due to colder weather or other environmental changes.